This is the ultimate hobbyist and student laser kit! 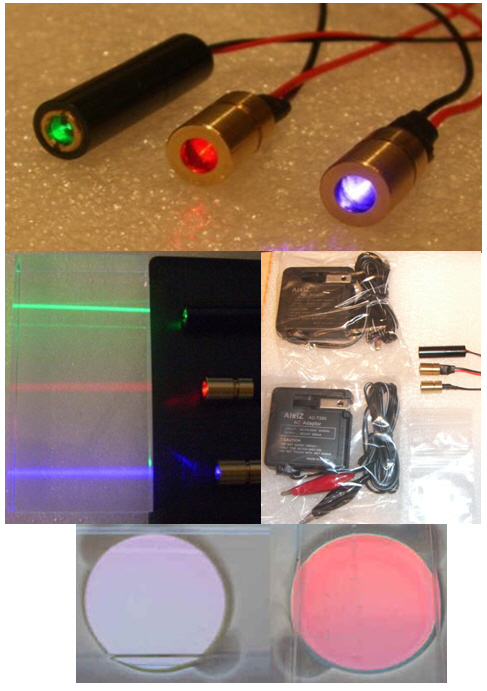 Everything you need to work with red, green and blue lasers. You get the following: 1 - 650nm 5mw red laser 8x13mm 1 - 405nm 5mw blue laser 8x13mm 1 - 532nm 5mw green laser 8x30mm 1 - 3.2VDC power supply for the red and green laser 1 - 5.0VDC power supply for the blue laser 1 - Set of dichro lenses for combining the laser colors for micro laser show or science experiments! Buy now and have fun!